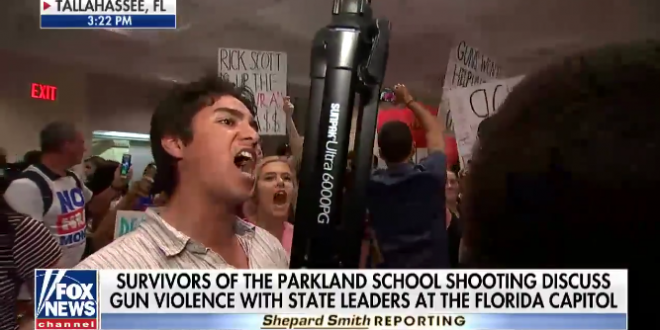 Students Descend On Rick Scott's Office [VIDEO] - Joe.My.God. Student protesters delivered a petition and chanted slogans in the office of Florida Gov. Rick Scott (R) on Wednesday ahead of meetings between the governor and students from the Parkland high school affected by last week’s school shooting. A spokeswoman for Scott’s office confirmed to The Hill that protesters delivered a petition and demanded an audience from Scott, who was not in the office at the time. Upon learning Scott was elsewhere, the demonstrators chanted “shame on you” and “face us now” at the absent governor. Video captured by Fox News shows dozens of students swarming the governor’s office demanding a meeting, despite what Scott’s office says was a public notice of meetings later in the day that was posted on the governor’s schedule this morning.